I live in next door to a state university in an old industrial city where green space is at a premium. 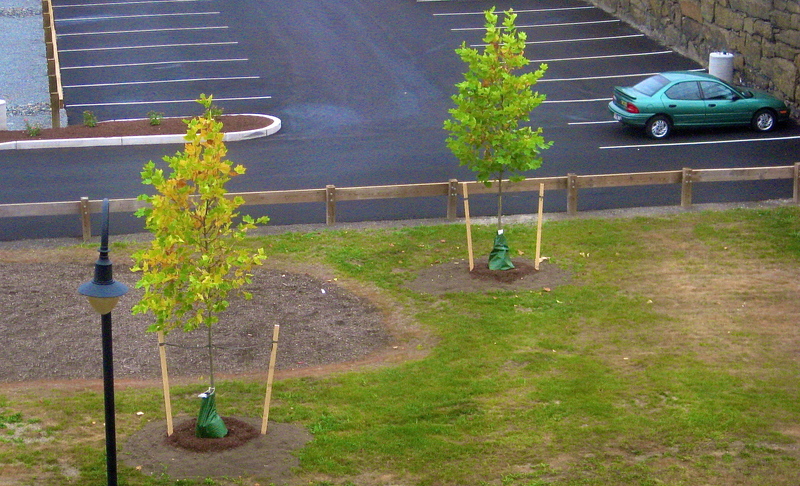 A little over a week ago, a crew from the university’s buildings and grounds department planted seven young trees around a new parking lot that happens to be right outside my windows. Even as they were going into the ground, I felt an almost irrational concern for those saplings. I worried that the B&G guys had not planted the little root balls deep enough. I fretted that they were piling the mulch too high around such slim trunks. I wondered if they’d watered them enough during the first three days when the sun was blazing hot. Now I find myself looking out the window and checking their progress every time I get up to get a snack or retrieve the mail or find a new book or start supper, as if my looking will prevent them from shriveling up and dying from moment to moment, or help them grow twenty feet from mid-morning to noon. I hope I’m not turning into a nosy neighbor who peers through the drapes, keeping a prurient eye on everybody’s comings and goings. I’m not sure it makes much sense, my proprietary concern for seven saplings around an asphalt lot; but these are my trees. I wish I felt this way about everything that lives. This entry was posted in Marginal Notes on August 29, 2013 by sicutlocutusest.